SONNET FROM THE FILM "LOVE FOR LOVE"
Alla Pugachova ranks among the most reputed Soviet pop-singers. Her appearances in concert halls as well as on the radio and TV enjoy tremendous success. Alla graduated from the Ippolitov-Ivanov Music School in Moscow, and then performed with the companies of Lipetsk and Moscow Region philharmonic societies, with Oleg Lundstrem's jazz orchestra and the popular Jolly Boys group. Her excellent voice, ranging from deep contralto to ringing soprano, a gift for acting and the ability to express a whole gamut of emotions make her a highly original and attractive performer. It is so often that her song is in fact a scenic miniature, a three-minute spectacle where music and lyrics are equally important and movement is in perfect harmony with singing - the effect being what is called the "song's image". The talented singer is in the heyday of her artistic career. Inertness is alien to her; she is in a constant search for new colours, rhythms and forms. In 1981 she completed her studies at the stage direction department of the Lunacharsky State Institute of Dramatic Art. "Maestro", "Million Roses", which she sings creating an image and acting, brought her universal recognition. She has tried her hand in composition and produced more than twenty songs in which she expresses her ideas, moods and attitudes, and included them in her repertoire ("Keep Waiting and Remember Me", "Unquiet Road", "Rope-walker", and others). Alla Pugachova is her own artistic director - she herself finds the exact scenic realization of her conception, meticulously choosing each gesture, each step. She appears on stage with the Recital instrumental ensemble, and the musicians, while accompanying the singer, join in the acting, achieving close contact with the audience. 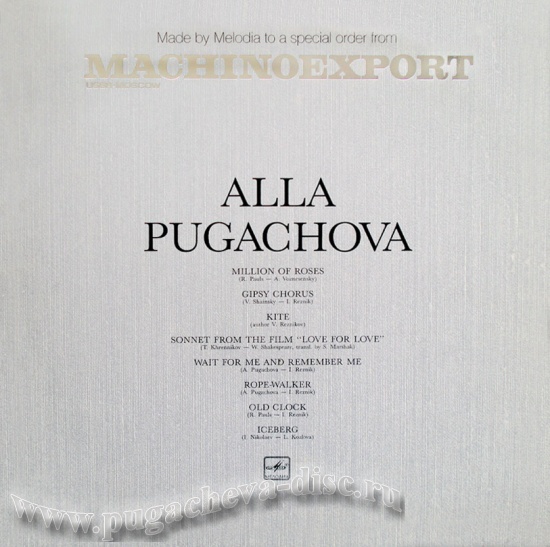 Alla Pugachova has toured with signal success in Federal Germany, France, Italy, Hungary, Cuba, Czechoslovakia, Yugoslavia, Poland and Sweden.